My Status Is Baddest: Happy Friday! 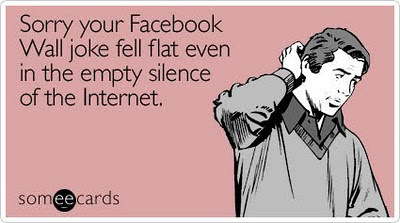 You've worked hard all week, and frankly, you don't feel witty or clever enough to come up with a status update. Help is here! Happy Friday! You've worked hard all week, and frankly, you don't feel witty or clever enough to come up with a status update. Help is here! ____ is too exhausted from planning to work out to actually work out. ____ can't figure out who in the hell this girl is that people keep quoting, and why everyone knows what she said. ____ has mastered the art of verbal combat and sarcastic witticism. ____ thinks that your incessant rambling goes perfectly with my terrible listening skills. ____ is not young enough to know everything. ____ as it turns out...disappointment DOES have a name. ____ thinks it's not the insanity that's the problem, it's the dim wittedness. ____ does not gossip, I emotionally speculate.